A fresh design to fit in more places, K-Mini Plus is attractive and easy to use. Considering its price, there are better coffee maker bargains out there. The new updated Mini brings a space-saving design and simplicity of use. Only 4.5 inches wide, the $99.99 K-Mini Plus is the slimmest Keurig machine on the market. It will fit anywhere in the kitchen or even your desk at work. Cord storage keeps your coffee corner tidy, and since it’s much lighter than other Keurig models it’s easy to move around. Like its predecessor Keurig Mini, the brewer has a single cup reservoir. You can brew any cup size between 6-12 ounces depending on how much water you pour into the tank. A single cup reservoir ensures that the water is always fresh, but it will require some extra time for heating the water for each cup. The reservoir can be removed from the base so it’s easy to rinse and refill. The space under the handle is nice and tall. It accommodates different cups, including travel mugs. The machine also comes with removable pod storage that fits nicely under the handle and can hold up to 9 k-cups. This storage is used only for keeping the area nice and organized and storing your k-cups, you will still need to manually get the pod out of the machine, just like with any other Keurig brewer. K-Mini Plus retails for $99.99 and is available in black and red. The coffee maker is simple to operate, too. There are only two buttons, that’s it. To make coffee, pour between 6 – 12 ounces of water into the tank and close the lid. Insert one k-cup, close the handle and press Brew button (if you want bolder brew press the strong button first). The light will pulse while it’s heating the water which will take approximately 2 minutes. When the light turns solid, the coffee will start brewing. It needs about one minute to complete brewing. The brewer will turn off automatically 90 seconds after the last brew to help save energy. The brewer uses all regular k-cups, branded and non-branded. It’s not compatible with k-carafe, k-mug or Vue pods. Make sure to also get a reusable cup – it will save you a ton of money (more than 50% savings per cup, compared to regular k-cups) and it will also help reduce waste. The Mini Plus won’t work with Nespresso pods, CBTL or Verismo pods. The K-Mini Plus includes a limited one-year warranty for normal home use. To keep your Mini in good shape, it’s recommended to clean the external parts or the brewer regularly and descaling it every three to six months. Customer service help is available 7 days a week at 866-901-2739. While I love the single cup reservoir because the water is always fresh, its main disadvantage is the fact that it needs to heat the water for each cup. This process takes about 2 minutes. So, if you want to make two cups, you will need to add water twice and it will take approximately 6 minutes to finish brewing those two cups. Considering it’s price, I would rather get a French press. It takes 4 minutes to brew one or several cups with a French press (here’s how to use coffee press), it makes better coffee, it also saves space, and costs less than $30! 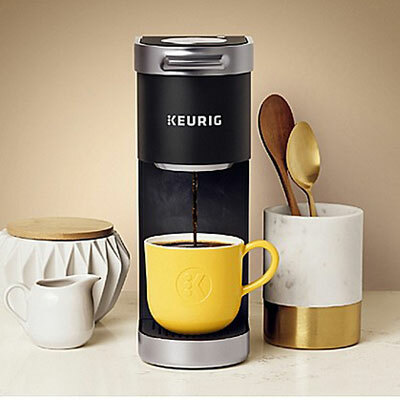 Compared to other k-cup models, the Mini Plus is a lot better than Keurig 2.0 since it doesn’t have the sensitive screen and works with all types of k-cups. It’s also much affordable than new K-Elite (has iced coffee button) or K-Cafe (comes with a built-in milk frother). If you do need a bigger water tank but you still want a machine within this price range, the K55 is always a good choice.